New ‘Air Services Index’ ranks North Texas fourth among the nation’s metropolitan areas. For most of human history, water provided the cheapest transport for both goods and people, and port cities thrived on coasts and rivers. Then railroads, highways, and airports eroded the coastal cities’ edge, giving inland markets their own ways to prosper. Today’s cities are still tied to one another by boats, trains, and motor vehicles, but air service has become increasingly important for economic growth in the 21st century. Moving people around has become key to modern businesses that seek to compete in global markets and get the most out of their highly productive workers. So how do U.S. cities measure up in moving people by air? Lists of the country’s busiest airports are easy to find, but we decided the answer needed something broader—an air services index. It doesn’t just compare the operations of particular airports; rather, it summarizes the totality of commercial air services available to passengers in each metropolitan statistical area (MSA). To create the index, we calculated a weighted average of four factors: the distance of nearby airports from the center of the MSA’s primary city, domestic services offered, international services offered, and growth in each MSA’s overall air services. The domestic component counts weekly nonstop U.S. flights, their destinations, and the number of enplanements (passengers boarding flights in the MSA). The international component combines the same data for foreign flights. A 60-mile radius from the primary city’s center defines the airports that serve each MSA. Our MSA Air Services Index, making its debut in this issue of D CEO, takes the point of view of business and leisure travelers, assuming they benefit from being able to fly more often to more domestic and international destinations. It recognizes that convenient, quick access to multiple airports is a blessing to travelers. The Dallas-Fort Worth area’s score incorporates both DFW International Airport and Dallas Love Field. New York residents have access to Newark Liberty International, LaGuardia, and John F. Kennedy airports, plus two or three regional facilities. Who Leads in the Skies? New York, with its three major airports, ranked first in the Air Services Index, and we assign it an index value of 100 (see table at bottom left of next page). Chicago, a two-airport MSA, comes next, followed very closely by Atlanta, which usually tops the annual ranking of the nation’s busiest airports. The Dallas-Fort Worth area stands at fourth—after a significant gap. Houston’s two big airports earn that MSA a spot in the Top 10. Among the rest of the Top 25, Boston and Philadelphia might be underserved for MSAs their size. San Jose, Calif., and Charlotte, N.C., have strong air service for their size. Four MSAs seem totally out of place among the urban heavyweights: Bridgeport, Conn.; Lakeland, Fla.; Ogden, Utah; and Toledo, Ohio. Their secret: being close to big MSAs with ample air service. Bridgeport, an hour or so outside New York City, ranks fifth because its business travelers can choose from LaGuardia, JFK, and airports in Westchester County, N.Y., and New Haven, Conn. The plentiful air service helps explain why so many of New York’s corporate bigwigs find it convenient to live in the Bridgeport area. Lakeland in central Florida finds itself in the Top 25 because of its proximity to airports in Tampa, St. Petersburg, Orlando, and Sarasota. The breakdown between domestic and international air service tells us a bit more (see charts at top of next page). New York’s air services edge rests largely on international operations, where it ranks first in destinations, enplanements, and flights. Within the United States, New York cedes the top spot to Atlanta for domestic destinations and enplanements, and to Chicago for flights. 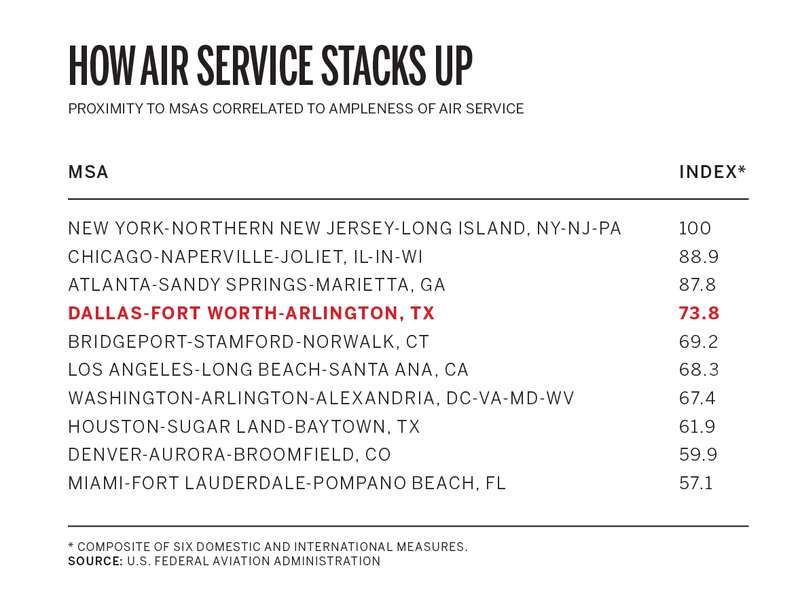 Dallas-Fort Worth, the nation’s fourth-largest MSA, holds its own on domestic air services, ranking third in destinations and fifth in enplanements and flights. On the international side, however, the area slips to ninth in destinations and flights, and to 11th in enplanements. Both DFW International Airport and Dallas Love Field recognize that North Texas could use more international air services, and they’re busy adding capacity to foreign cities. MSAs have every reason to improve their air services, but it’s not always easy. They can, of course, raise money to expand local airport capacity, but in the end, it’s still a matter of supply and demand. The overall demand for business and leisure air travel evolves slowly over time, driven by population and income. On the supply side, airlines’ business models, strategic goals, and operational constraints affect their willingness to add destinations, flights, and seating capacity. Those with experience in trying to lure companies to the Dallas-Fort Worth area regularly testify to the importance of air services in making pitches to companies like Toyota, which decided last year to move its North American headquarters to Plano. In the relocation game, firms looking for greener pastures make lists of what they’d like and what they absolutely need. More often than not, companies identify air services as a must—not the only one, but an important one. Having top-flight air services may not seal the deal, but MSAs that don’t measure up won’t get serious consideration. San Antonio and Austin are growing, but both may be handicapped in recruiting big companies because they rank low in air services (Austin at No. 47 and San Antonio at No. 50). From these cities, many trips start with a flight to either Dallas-Fort Worth or Houston. Extensive air services are an asset in attracting new business, but the impact on in-migration runs into the same incongruity we found in “The Paradox of Amenities” (see D CEO’s October 2015 issue). Cultural, entertainment, and recreational amenities should be catnip for people. The data, however, shows Americans moving out of the most amenity-rich MSAs, particularly New York and Los Angeles. It’s a puzzle, to be sure. We resolved it by noting that great amenities give cities more leverage to raise taxes and push up living costs. People eventually decide to find more affordable places to live, even if it means sacrificing some amenities. Mirroring these other urban amenities, better air services show a negative correlation with net migration. Most people undoubtedly see the benefit of having busy airports nearby; unlike relocating businesses, however, they probably don’t regard it as a make-or-break matter in deciding the best place to make their home. When it comes to meeting travelers’ needs now and in the future, MSAs with growing airport services are better bets than those with shrinking capacity. Two-year growth rates are highest in the small MSAs of Ogden, Utah, and Lakeland, Fla. Houston finished fifth in growth, while the Dallas-Fort Worth area ranked No. 12. Growth of local air services may accelerate in 2015, the first full year with Dallas Love Field free from Wright Amendment limits and American Airlines, the top carrier at DFW, out from under the strain of its bankruptcy and merger.